This Volterra Coin Box comes with an elegant mahogany wood-grain finish, complete with padded lid, a black satin lining, and a certificate of authenticity ribbon. The Volterra Coin Capsule Box has a molded black velour insert, a solid construction, gold-plated hinges, and a secure magnetic closure. It snugly holds 6 Quadrum coin capsules with standard 50 x 50 mm outside diameters. Kitco offers this 6 Quadrum Coin Capsule Volterra Coin Box for sale on our online store. 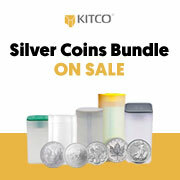 It makes a perfect gift box for bullion or collectible coins.